MY MINI GUITAR POJECT - guitarfritzs Jimdo-Page! It is unplyable but it looks great to me! 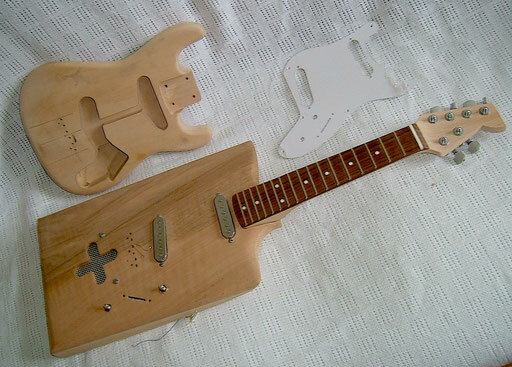 offered this cheap baby guitar kit. Basswood body, maple neck and two very cheap singlecoils which I replaced with these lipsticks. 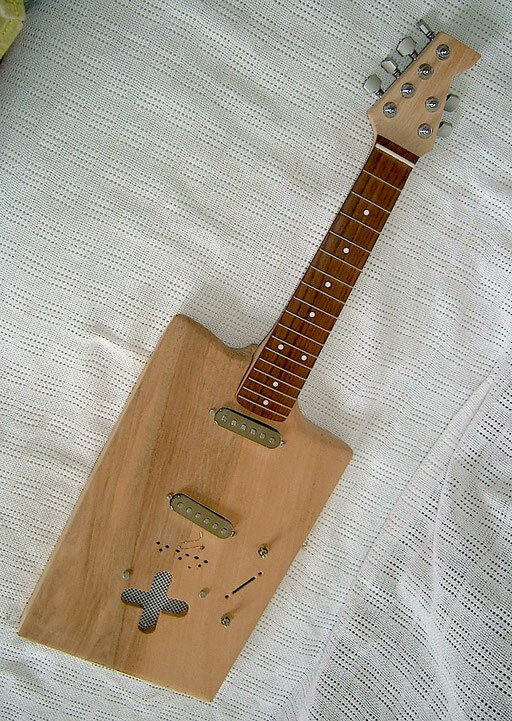 I also upgraded the thing with Sperzel locking tuners but I still can`t get it in tune and play it. 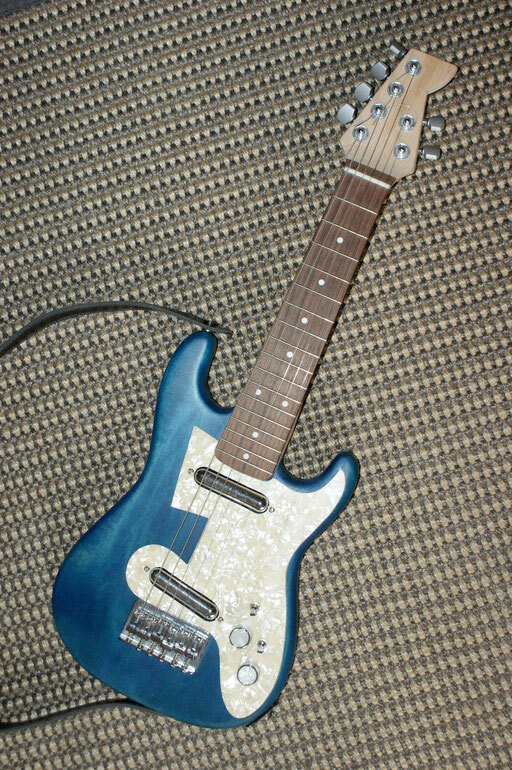 The pickguard that came with the kit looked like a normal Strat pickguard. But I had to find my own solution that I still like a lot. I made my little son choose a colour and then dyed the body accordingly and I designed my owen 4+2 headstock. 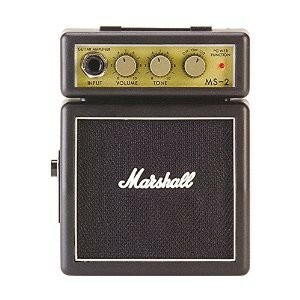 I think one switch choses between series and parallel wiring and the other chooses between the pickups. The scale is so short that I never knew what strings to use and that I never played the little sucker. The guitar was meant to seduce my little son to become a guitar player. I`m not even sure if the wiring ever really worked... 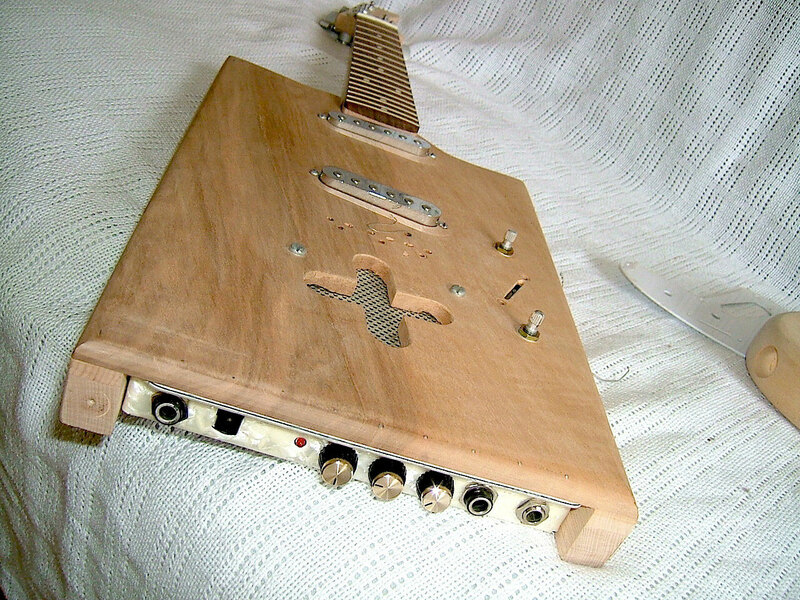 I can`t remember... this thing is 10 years old at least and it was one of my first attempts to wire a guitar. 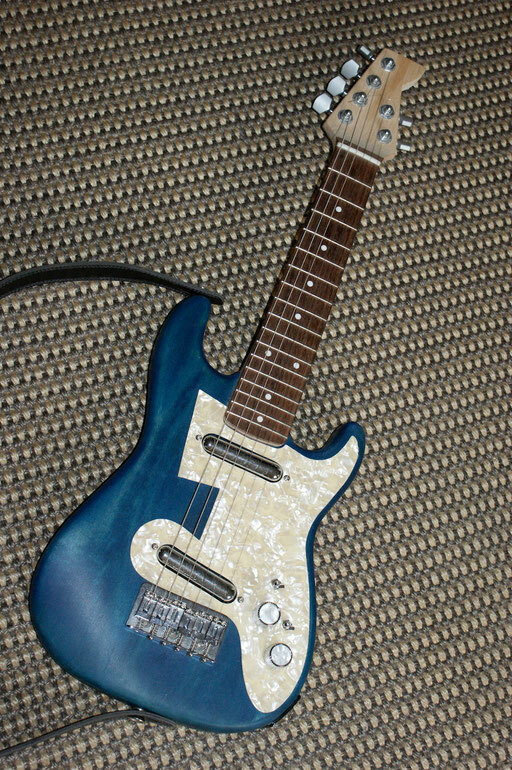 I adore the way this guitar looks and I think I should build a grown-up version! 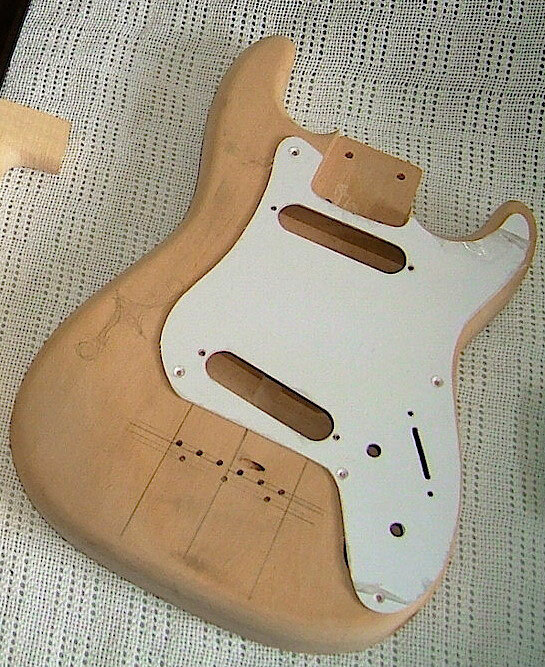 the original pickguard and the body before I dyed it. 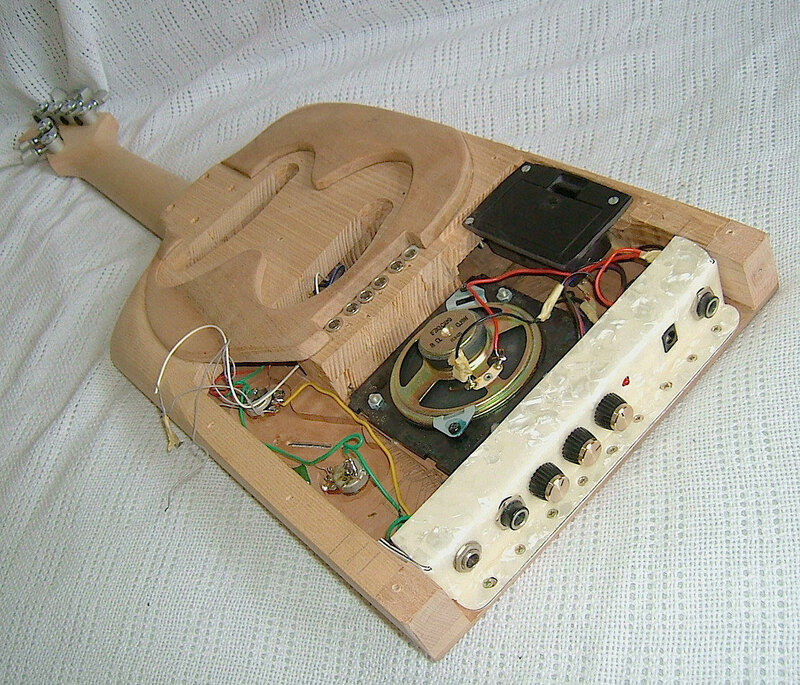 For some time I used the kit`s neck with a different body that contained a mini amp . one of theses suckers was torn to pieces in order to build this guitar body. I made a new front panel from mother-of-toile-seat, an sah body with a walnut top and pickup access from the back. Bridge missing. The Bo Diddley inspired body design wasn`t perfect. I was in a hurry when I decided to build this thing. I wanted a travel guitar with built in amp. So I ruined one of these little Marshall pocket amps and built this odd guitar body inspired by Bo Diddley`s great simplistic rectangular Gretsches. I had to catch my train. So I went on holidays without the guitar and never finished it. No idea whether I still have this body. See it on my STEINBERGER-site.